Agricultural communities are at risk for a number of hazardous or emergency situations - natural disasters, biological disease emergencies and man-made or technological hazards (e.g., agrochemical spills, bioterrorism). Any of these can greatly impact individuals, farms, animals and businesses in the affected areas. Taking steps to prepare for these events before they occur can prevent or minimize the impact on human and animal health or property damage. This website houses a database of resources and factsheets to help citizens of rural agricultural communities prepare for and recover from a number of natural, biological and man-made threats. SELECT ONE OF THE COLORED TABS ABOVE to find resources to help prepare yourself, your family, your animals, your family and your business for a variety of hazaardous situations. 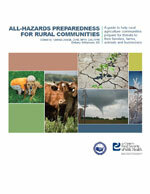 The All-Hazard Preparedness for Rural Communities booklet can be downloaded for free, and outlines preparedness and recovery tips. 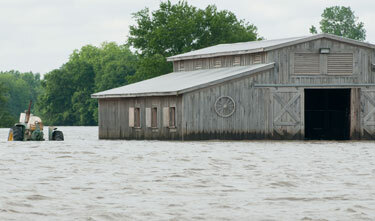 Learn what to do before and after flooding situations to protect your farm. Find current food safety recalls to keep your family safe. Know what to do if the power goes out after a natural disaster. Find assistance for your family and farm after a disaster.